Home / best phone under 10000 / best phone under 15000 / mi mobile / mi mobile price / mi phone price / Mobile / moto mobile / News / samsung mobile / samsung mobile price / samsung new mobile / sony mobile / Samsung Galaxy M10 and Galaxy M20 : compare? Samsung Galaxy M10 and Galaxy M20 : compare? 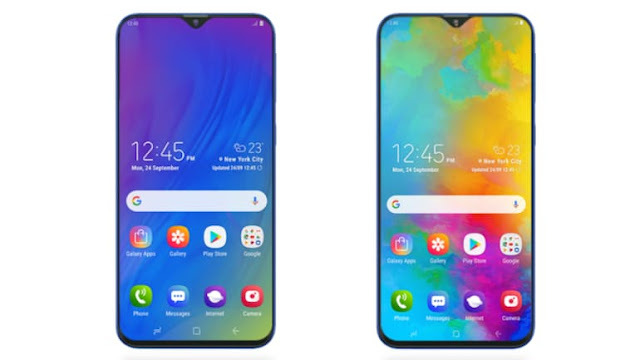 South Korea's mobile maker Samsung launched Galaxy M20 and Galaxy M10 smartphones in the Indian market on January 28 under its new Galaxy M series. Some features in the Samsung Galaxy M10 and Galaxy M20 are the same as the Infiniti-V display panel and dual-rear camera setup for photography. Samsung Galaxy M10 and Galaxy M20 : compare?-There is a major difference between RAM/storage and price between Samsung Galaxy M20 and Galaxy M10. Today we will explain to you the difference between price, design, and specification by your articles. The biggest difference between the cost of both handsets is the difference. The price of Samsung Galaxy M10 starts at Rs 7,990. This price will get 2 GB RAM / 16GB storage variant. 3 GB RAM / 32 GB storage model will be sold for 8,990 rupees. Samsung Galaxy M20's 3GB RAM / 32GB storage variant will be available at Rs 10,990. Its 4 GB RAM / 64 GB storage variant costs Rs 12,990. Both phones in the Samsung Galaxy M series will be sold at Amazon.in and Samsung India e-store. New phones will be found in charcoal black and ocean blue colors. For the information of the people, let us know that the sales of these handsets will begin on February 5 from Amazon India and Samsung India E-Store. Samsung Galaxy M10 and Samsung Galaxy M20 come with both phones Infinity-V display panel. Galaxy M20's display is slightly larger than the Galaxy M10. Compared to the Galaxy M20, the border at the bottom of the Galaxy M10 is slightly higher. In both phones, the user will also be able to add a MicroSD card with two nano-SIMs. The main difference between the two handsets of the Samsung brand is that Galaxy M20 has a fingerprint sensor for security but in Galaxy M10, you will not get this feature. At the back of the Galaxy M10, there is a speaker grill on the bottom, while the speaker grill has been found on the lower part of the Galaxy M20. In the Galaxy M10, there will be a USB Type-C port for users in the Galaxy M20. Volume and power button on the right side of the phone and 3.5mm audio jack is located at the bottom of the phone. Both phones go on the Samsung Experience 9.5 based on the Android 8.1 Oryo. The Samsung Galaxy M10 has a 6.22-inch HD + (720x1520 pixels) TFT display. Its aspect ratio is 19.5: 9. At the same time, the Samsung Galex M20 has a 6.3-inch full-HD + (1080X2340 pixels) TFT display. Its aspect ratio is 19.5: 9. Now speak of the processor, RAM, and storage. The Galaxy M10 uses the Octa-Core Xynon 7870 processor. Based on the RAM and storage, this phone has two variants - 16 GB storage with 2 GB RAM and 32 GB storage with 3 GB of RAM. Galaxy M20 has an Octa-core Axinos 7904 processor. This phone, based on RAM and storage, also has two variants - 64 GB storage with 32 GB of RAM and 4 GB RAM with 3 GB RAM. Both variants of both mobiles will support MicroSD cards up to 512 GB. Now talk camera setup and Both phones are equipped with dual rear camera setup. On the back side, there is a 13-megapixel primary sensor with F / 1.9 aperture. With this, a 5-megapixel Ultra Wide-angle camera with F / 2.2 aperture will work in Jugalbandi. You people will only see the difference in the front camera. For selfie enthusiasts, Samsung Galaxy M20 has an 8-megapixel front camera with F / 2.0 aperture. At the same time, the phone has a 5-megapixel camera with F / 2.0 aperture for Selfie in the Galaxy M10. Now talk about battery capacity Galaxy M10 has a battery of 3430 mAh while the Galaxy M20 has a battery of 5,000 mAh.